For Grebe, the challenge of being nonpartisan within the confines of the Bradley Foundation and clearly hyperpartisan outside of it requires a mental discipline that is difficult to imagine. Is it possible to create such an impermeable firewall within one person, one with the resources, influence, and history of Mike Grebe? 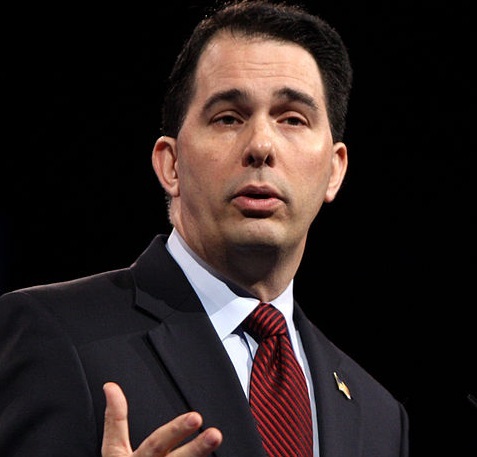 Walker’s credentials on the national stage are in his gubernatorial leadership of Wisconsin. Republicans have made Walker’s time in the state house the petri dish for an array of conservative policies that Walker can claim to have overseen and shepherded to fruition. Most recently, the state senate passed a right-to-work bill last month, which would trim the power of private sector unions the way Walker’s budget bill nicked the public employee unions. Walker’s most recent state budget proposal lifts the cap on students receiving vouchers to attend private and religious schools and partly pays for the expansion with reductions in the per-student funding available to traditional public schools. It is hard to find anything in the Walker policy canon that doesn’t have roots in the texts of Bradley Foundation publications or in the research of Bradley-funded conservative policy think tanks. In a bit of humblebragging, Grebe was quoted in Agenda Setting to say, “We’ve been more successful at the honoring [of conservative intellectuals]…and less successful at creating broad awareness of what they’ve done,” a statement difficult to take on face value given the widespread support, often from liberals as well as conservatives, of Bradley Foundation themes such as school choice and welfare reform, with the Wisconsin welfare reform initiative serving as the model for the national welfare reform program that was ultimately signed and implemented by President Bill Clinton. Nonetheless, veering from support for policy ideas to support for political candidates is the line that foundations sometimes slide across, not only to their own detriment but that of the nonpartisan credibility of the philanthropic sector. When it came to the scandal concerning the voter intimidation billboards erected in minority neighborhoods during elections and other alleged incidents of coordination between “independent” policy organizations and the political campaign operations of Scott Walker, one of the loudest voices attacking Milwaukee County district attorney John Chisholm, who launched investigations, came from nationally syndicated columnist George F. Will. Will’s column was short on full disclosure, failing to reveal that he was the recipient of a $250,000 Bradley prize in 2005, that he sits on the Bradley Foundation board of directors, and that the organizations Chisholm was investigating were largely connected to the Bradley Foundation, including the organization providing them with legal advice, the Wisconsin Institute for Law and Liberty—and, at the time, Grebe was chairing the Walker election apparatus. Cleta Mitchell, a partner at Foley & Lardner, Grebe’s old law firm, has served as counsel to the National Republican Senatorial Committee, the National Congressional Republican Committee, the National Rifle Association (in its Supreme Court case on campaign finance), and reportedly politicians and candidates such as Sen. Jim DeMint (R-SC), Sen. Jim Imhofe (R-NE), Sen. Marco Rubio (R-FL), Sen. Roy Blunt (R-MO), Sen. David Vitter (R-LA), Sen. Pat Toomey (R-PA), Sen. Kelly Ayotte (R-NH), and Tea Party Republican candidates Sharron Angle (NV) and Joe Miller (AK), though she famously declined to represent Christine O’Donnell (DE). Mitchell has been on the board of the National Rifle Association, the NRA Freedom Action Foundation, and the American Conservative Union, which runs the Conservative Political Action Conference, the annual confab for putative Republican presidential candidates to show their wares and stand for a straw popularity vote. Richard W. Graber was President George W. Bush’s ambassador to the Czech Republic, but in Wisconsin politics is known for his role for many years as chairman of the Wisconsin Republican Party, a Republican delegate or alternate at various Republican Party conventions, and a member of the Republican National Committee. Speaking for the Wisconsin Republican Party in 2004, Graber told the Milwaukee Journal Sentinel, “It’s not a leap at all to say the potential for voter fraud is high in the city, and the integrity of the entire election, frankly, is at stake,” raising an issue of voter impersonation that multiple studies have concluded is negligible around the country, but a constant Republican meme behind incidents like the billboards scandal. Art Pope has been a Libertarian and Republican activist, a Republican member of the North Carolina state House of Representatives, a chairman of the North Carolina Republican state convention, a candidate for Lt. Governor, and, until he took a position as State Budget Director in the administration of North Carolina governor Pat McCrory, a board member of the Civitas Institute and Civitas Action, both created by his family foundation and the latter involved in campaign mailings against Democrats, and the Americans For Prosperity, one of the major dark money entities supporting Republican candidates. Board member Terry Considine is a former Republican state senator from Colorado and an unsuccessful Republican challenger of Ben Nighthorse Campbell for the U.S. Senate (when Campbell was a Democrat). His bio includes his role as one of the founders of the Club for Growth, another of the powerful dark money supporters of very conservative Republican candidates. While others on the board do not appear to have quite those GOP organizational credentials, they have been big supporters of Scott Walker’s campaigns, including board members Patrick English, who along with other members of his firm, Fiduciary Management, maxed out on their giving to Walker one year and were cited for improperly passing money to the campaign through the Metropolitan Milwaukee Association of Commerce, David Uihlein, one of the Schlitz beer heirs who has been generous with campaign contributions to Scott and his allies, and Diane M. Hendricks, who reportedly gave $1 million to the Wisconsin Republican Party and was the largest donor at $500,000 to Walker’s campaign fighting against recall. The biographical information about the Bradley Foundation board members would appear to make board meetings seem more like gatherings of the Walker presidential campaign finance committee. It is a political cast that makes the Bradley Foundation look nothing like a place where Grebe and his colleagues can possibly shut off their common interests not only in Republican electoral politics, but perhaps even more specifically the aspirations of Scott Walker for higher office. The Grebe quote in the Philanthropy Roundtable’s Agenda Setting volume should be a sharp reminder to foundations on the right and on the left that their nonpartisan commitment will be suspect if their executives and board members seem to be largely aligned with political parties and political candidates rather than political ideas. Foundations providing grants for the thinkers and researchers on the left and right need not devolve into being seen as functionaries for politicians or, in the case of Will’s defense of the independent nonprofits allegedly coordinating with the Walker campaign, functionaries without the all-important disclosure of their interrelationships.